When my 7 year old daughter suggested we take Ossie to Pennywell Farm for his third birthday I knew it would make the perfect day out. There are animals to cuddle, shows to see and lots of play areas. However, I was a little worried that there might not be much to entertain older children. Would my 10 year old son and 11 year old nephew seriously be interested in spending a day on the farm? Well, actually, yes - there was plenty to keep them occupied too and they loved it! We awoke on the big day to find that, yet again, it was raining. But never one to be defeated at the first hurdle, I bundled everyone into waterproofs and wellies and reassured myself that the weather forecast app on my phone really had forecast that the rain would stop by 10am (it didn't stop until nearer 1pm, but it was drizzle rather than proper rain so our spirits weren't too dampened). Upon arrival at Pennywell Farm, the children were given name stickers with their ages on as we queued to pay. And because it was Ossie's birthday, he was given a special rosette, which meant that he got to go first on some of the activities. I was slightly saddened that with my baby turning three, I now had to pay for all four children (no more free entry for the youngest). However, for once I had planned ahead and I had cut out tokens from the local newspaper to bag myself one free child entry. One of my favourite things about a day at Pennywell Farm is that there are plenty of hands-on activities throughout the day. Even if you don't check the activity timetable in the main farmyard, there are announcements to let you know what's happening next. We didn't arrive in time to catch the egg collecting from the hens or the goat milking, but we were able to join in with the bottle-feeding the goat kids and lambs, which the children absolutely loved. We didn't do the pond dipping; partly because I was convinced one of my four would fall in and partly because the older children wanted to play on the assault course and the younger two were desperate for a snack stop. Once appetites had been sated, we had a ride on the little Rainbow Railway and managed to get round the Willow Maze without getting lost. Before getting through a bit more of our picnic and heading to the Pennywell Theatre to sing animal songs with Poco Drom - even the adults were encouraged to join in the actions and the older boys definitely got into the spirit of singing and dancing. At each activity - the children can collect a stamp and if they fill their card, they qualify for a free child return visit (with a paying adult). In between the planned activities there is plenty of time to cuddle the animals - grandma got particularly attached to a goat kid, ride the Red Rocket, have a go on the ride-on toys, jump on the trampolines, play mini-golf and enjoy the bouncy castle in the indoor play barn. Despite spending nearly all day at Pennywell Farm, we still didn't manage to fit everything in. So we'll have to revisit to try out the Run Rabbit Ride and the Tractor and Trailer Rides. 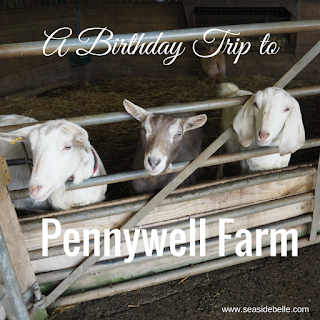 Pennywell Farm is big enough for a full day out but small enough to allow older children to play independently on things like the assault course or the trampolines while you stay with smaller children on things like the ride-on tractors. This meant that nobody was bored as there was always something to see and do.